I have been teaching classes and workshops for over 20 years to both adults and children. 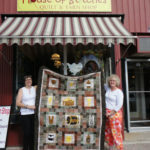 We’ve had fun exploring many types of quilting techniques from traditional piecing to folk art to embellishing. I love to see what people come up with for colour and fabric and I always learn new things too. Here is a selection of some of my current workshops, I am also happy to discuss other topics, so please send me a note if you are interested. Thanks . very useful article. I am taking your workshop with the Orillia Guild in a few weeks. I am wondering why the experienced sewers are to trace the pattern twice on the black background. Marion, sorry for any confusion. You need to trace the design twice-on the black fabric facing the right way (once) and on your fusible reversed (once). Only one tracing on the black, but two in total. I am looking forward to the trip too! I have made a page for the tutorial if you want to have a look-check out the “stained glass technique” tab in the header on the site. would like to know the space and items that you require for your demos and make and takes. Do you require electrical? Just making my plans-I will be in touch shortly!